This flood barrier is located where the Hunte flows into the Weser. Having four powerful flood gates and a breadth of some 120 meters, it protects the hinterland against storm tides. The facility began operating on the 1st of October 1979 and was one of the largest coastal protection facilities of this type at the time. Each direction of travel has ist own gate which has a breadth of 26 meters, and the two-part miter gates remain open as long as possible in order not to disrupt the shipping. The flood barrage will be closed only when the Weser rises to a water level of three meters above normal. On a daily basis, always at the top of the hour, the nearly vertical rolling lift bascule bridges are lowered in order to allow pedestrians and cyclists to reach the peninsula Elsflether Sand. Four mighty, convex-shaped barrage gates can be closed during a storm surge, protecting the hinterland against flooding. The river flood barrier also contains a bascule or folding bridge, allowing maritime traffic to pass through unimpeded. During the daytime, the bridge is closed every hour on the hour for five minutes, enabling pedestrians and cyclists who are travelling across the Hunte towards Elsflether Sand to conveniently reach their destination. Both of the rolling bascule bridges, each having a length of 32 meters, point straight up into the sky upon being open for Weser shipping passing along the mouth of the Hunte. Among the components of the protective system for the Lower Weser region are two other flood barriers. These are located along the Ochtum and the Lesum, two tributary rivers which flow into the Weser further upstream. Given that the operation of one barrage inevitably impacts on the others, a reciprocal coordination and the exchange of estimates as to the expected water levels are essential. Indeed, it is of vital importance to analyze the water level development and to take the different barrage combinations into consideration as soon as possible. The Hunte Barrage will be closed only in the event of rising water levels (subsequent full closure). The closing begins upon the water reaching a level of 2.80 meters above mean sea level, as measured outside of the barrage, if tides with a peak value of 3.00 meters above mean sea level are to be expected. If it can be guaranteed that the peak value will not exceed 3.10 meters above sea level, it is possible to keep the barrage open for shipping traffic. On the other hand, tides exceeding 0.9 meters above the middle tide flood level will be blocked. This system ensures that the maximal water level of 3.3 meters above mean sea level in Elsfleth and Oldenburg will not be exceeded. In the summer half-year (from the 1st of April until the 15th of November), however, the barrage can be closed earlier in the event of a higher water inflow. The tidal conditions which we experience today along the Lower Weser have only developed within the last 100 years. Prior to the first Weser expansion in 1888, a tidal range of 20 cm was observed in Bremen. Today, the mean tidal range in Bremen-Oslebshausen amounts to 3.9 cm. Although the peak value of the water level during earlier storm surges between Bremerhaven and Elsfleth declined and was noticeable only after reaching Farge, the peak value rose during the storm surges on the 28th of January 1994 and on the 10th of January 1995 already between Bremerhaven and Brake. Accordingly, the peak value of the water level registered in Brake was higher than that measured in Bremerhaven. As a result of the Weser expansion, the “tide was brought to Bremen”. The Lower Weser region now experiences tidal activity directly. In the past, the Weser shore beneath the City of Bremen was threatened during high inflows primarily by drainage obstruction. Today, however, this region is immediately threatened by storm surges and flood waters. Elsfleth is one of the oldest settlements on the Lower Weser. It is first mentioned in a document from 1220, but probably already developed in the 9th century. 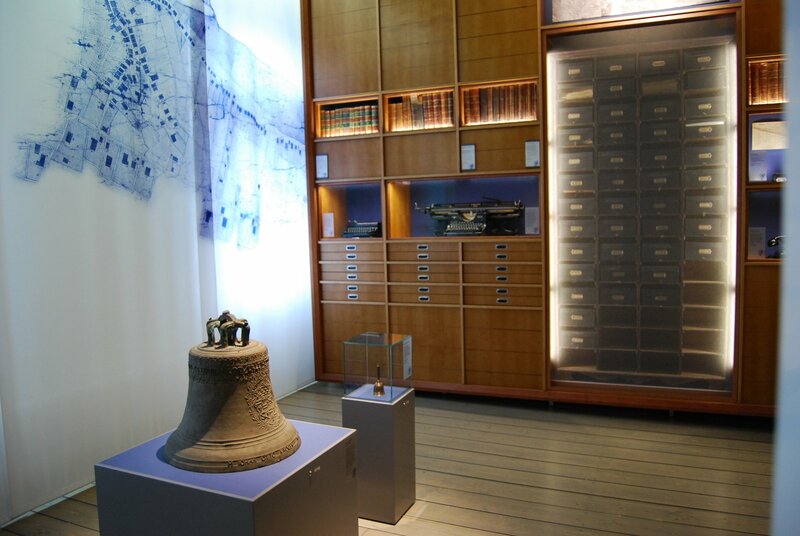 In "Haus Elsfleth" you find a model of the former toll station and various decrees and other documents from the town’s history.